February's right around the corner, and you know what that means? It's almost National Hot Breakfast Month! To prepare, we're giving you a couple of brand-new, super-delicious breakfast recipes. Aren't YOU lucky?! Mushrooms, Swiss cheese, bacon, and apples?! This slightly sweet frittata is so good, you'll want to add it into regular rotation! In a medium bowl, combine egg substitute and creamer. Whisk together for 1 minute. Add Swiss cheese and cheddar cheese. Set aside. Add bacon and mushrooms, and cook until bacon is slightly crispy and mushrooms begin to soften, about 3 - 5 minutes. Add apple and continue to cook until softened, about 2 minutes. Pour egg mixture into the pan, and tilt pan back and forth to ensure egg mixture is evenly distributed. Make sure cheese is evenly distributed, as well. If needed, run a spatula along the sides of the pan to help egg to flow underneath the bacon, mushrooms, and apple. Cook for 2 minutes, and then remove from heat. Sprinkle Parm-style topping evenly on top of the frittata. Place under the broiler. Allow to cook for about 4 minutes, until the egg has puffed up and the mixture is set. Allow to cool, and then cut into quarters. 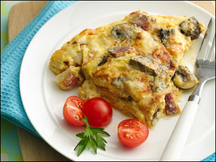 (Frittata may look runny, but it's just all the cheese oozing out!) Enjoy! AHHHHHHHHHHH! Is it breakfast or dessert? This decadent morning-meal recipe is SO easy and ridiculously delicious. PLEASE make it ASAP. You'll FLIP! In a medium-large bowl, combine all other ingredients (cream cheese, soymilk, egg substitute, syrup, butter, cinnamon, and sweetener). If you like your French toast pretty sweet, add an extra packet of sweetener. Using a handheld electric mixer set to medium speed, mix until lump-free and smooth. Pour mixture over the bread and apple. Bake in the oven for about 45 minutes, until egg mixture is pretty firm and cooked through. (Be sure not to overcook, as bread may burn.) Let cool slightly and cut into quarters. If you like, serve with additional syrup for dipping. Dig in! Hungry for more? 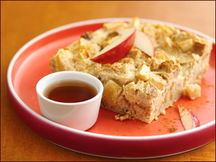 Click HERE and HERE for loads more guilt-free breakfast recipes!!! Be a pal. Pass these recipes on to everyone you know who eats breakfast. Click "send to a friend" NOW!